If you follow me on Instagram, #yearofhats is probably the hashtag I should be using! 2017 is proving to be a hat-filled year and I'm pretty darn excited about that. As knitters, I feel like we can appreciate the time and effort that goes into every project we create. But sometimes, its relaly nice to find a project that flies off thte needles. And weirdly enough, this lovely hat does just that! Worked in two layers, you'll blaze through the inner hat and marvel at the beauty of the outer hat. You basically knit two hats - but the inner hat is worsted weight so it knits up in just hours. It seems crazy to make an entire inner hat of which you only see the brim, but it's worth it once you work the outer layer and you can see the inner hat color popping through the lace work. I made the size small and am modeling it above on a 22" circumference head. When you complete the inner hat, clip a removable marker to the brim at the beginning of round so you know where your beg of round is for beginning the outer hat. Lesley has provided a great video on picking up the stitches which is super duper helpful! Using the removable marker that you clipped to your brim when you finished the inner hat, begin picking up the stitches per Lesley's video. I found it much easier to use a crochet hook to pick up 4 stitches at a time and place it on the US 3 needle. For both sizes, you can pick up 4 stitches for every 3 on the original hat: pick up 1 stitch for each column of knit stitches you see, and then create a 4th by picking up a stitch between columns every 3 sts. For size small, you'll get exactly the right number of stitches if you work in this 4 for 3 pattern. For size large, you'll be a 6 stitches short. So work 1 additional round of *k23, kfb; rep from * to end to get to the required 150 sts. Once all the stitches are picked up, use a tapestry needle to thread the tail of the picked up stitches to the inside of the hat for weaving in later. I found it easier to work the outer hat with the inner hat turned inside out and hanging down, outside the outer hat. BUT! When its time to cinch the top of the outer hat closed, push the inner hat back up inside the outer hat so you can attach the two layers of hat at the top by pushing the tail of the outer hat through the top of the inner hat, and weaving in the ends. Due to the thickness of this hat, and therefore it's lack of "slouchiness" I recommend wet blocking this hat to your heads dimension, being careful not to block out the brim. Thanks for knitting along with us on this project! If you're on social media, feel free to tag #unapologeticknitter (or use @notsorryknitter on IG) so I can see your amazing creations! I can't wait to KALFH with you! It's KNIT GRAFFITI month, y'all! Ok, I'm not from Texas so the "y'all" likely isn't necessary but that's where the lovely Lesley lives so I'm channeling her a little bit. Also, she's not originally from Texas so it really isn't necessary but it sounded good in my head. So... shall we just get right on down to the making of this hat, then? Ok! Man I wish I'd used a lighter-colored yarn for photos sake... but I love the color of this hat so I'm definitely not disappointed. When I sit down to knit something, there are some things I KNOW. None of these "things" are something I can take credit for - they're things taught to me by the masters along my knitting journey. And the first thing that I KNOW about this hat, is that the brim needs to be knit on a smaller needle. For it to stay on my head, it needs to be tighter at the cast-on and brim. If you like a super loose hat all the way, disregard this section. The hat is obviously wearable and comfortable at it's originally designed brim circumference, I just know that, for me, it would be too loose. Here's my breakdown on the brim: My general rule of thumb for hats is, when knitting the brim, use a needle 2 sizes smaller than the needle being used to work the rest of the hat. In this case, becasue I used a US 8 (5mm) needle for the body of the hat, I would use a US 6 (4mm) for the brim. HOWEVER! I also know that a fitted hat (for the average woman's head) is usually around 80 sts and a slouch hat is around 96 sts. This hat is actually even just a tiny bit larger than that so I made an executive decision and used a US 5 (3.75mm) for the Ribb pattern on the brim. IF! If you are an average to loose tension knitter, I do recommend a US 5 (3.75mm) for the brim, going up to the US 8 (5mm) for the body of the hat. If you are a slightly tighter knitter, go with a US 6 (4mm). 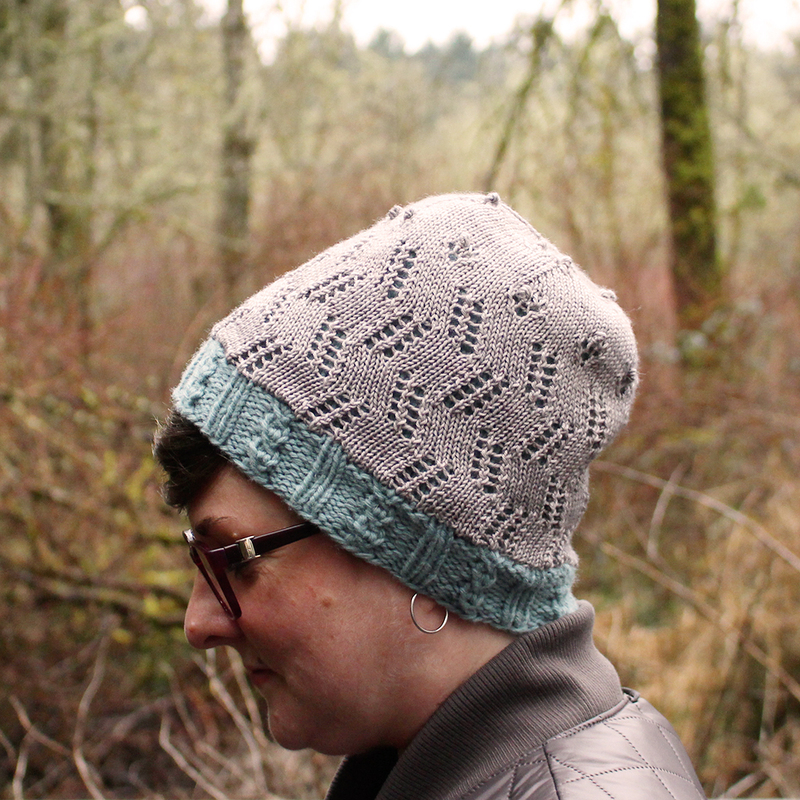 So, beyond my minor qualms with the size of the brim needle, there's not a whole lot to share about this hat. Lesley has provided both written out and charted instructions for the body of the hat, which I LURVE! I'm a chart girl all the way. 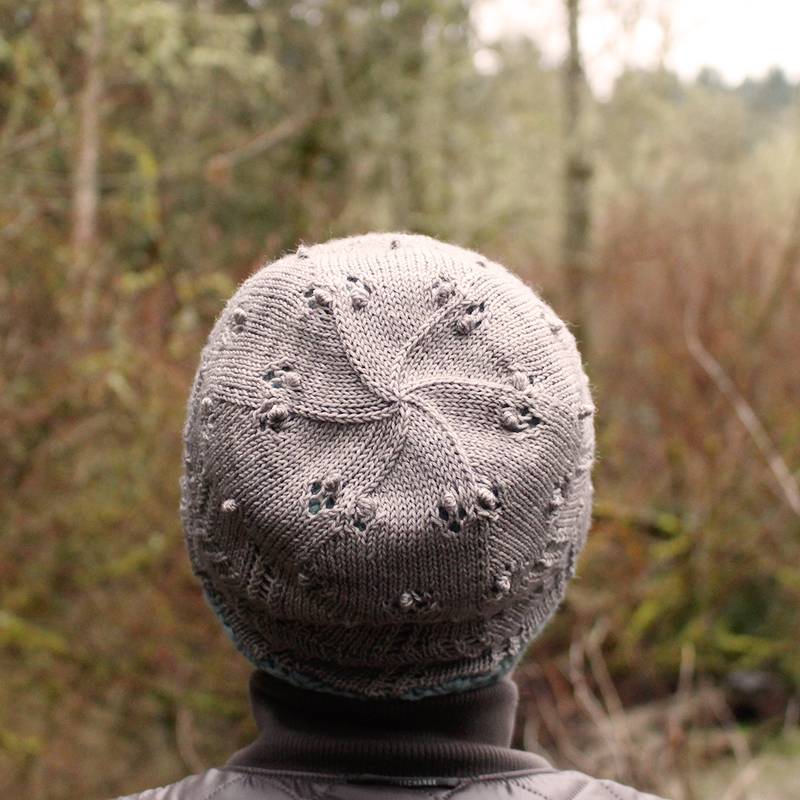 If you're up for a challenge, I recommend learning how to cable without a cable needle on this hat. The cables are fairly simple and while there aren't a ton of them, I always like to learn a new skill on a simpler project where I don't feel like I'd be overwhelmed using the new technique. TIP! One thing that Michelle doesn't mention in her video that I find helpful: using your right pointer finger, put pressure below the two stitches that are being removed from the needle. This way they cannot unravel as you move them! Because I know my tension gets wonky when i switch to DPNs, I changed a needle size. I went down to a US 7 (4.5mm) set of DPNs. This helps keep my tension in check for the crown shaping. I didn't decrease the FINAL round. I find that up to about 10 sts is an acceptable number of sts to cinch closed. So I didn't decrease down the final round so that I didn't have just 1 st on each DPN. Just a personal preference. If you're ok with that few sts, go for it! I wet blocked this hat over a balloon blown up to a 20" circumference. I know that with wear, a hat will stretch out so I didn't block to my full head circumference (which is 22").